Lack of access to clean water has resulted in a crisis for expectant mothers in Kenya, where rainfall has declined and become more erratic. The African Medical and Research Foundation (AMREF), working in the Kitui West and Mutito constituencies in conjunction with USAID, found 85 percent of women were delivering at home because the nearest health facility was at least 10 kilometers away and had no access to clean water, Meadowcroft says. Women were sometimes even asked to bring their own water to the clinic. In response, AMREF has initiated community-based programs in Kitui West and Mutito, improving the WASH facilities at five local health clinics; building new water tanks, latrines, and hand-washing stations; and also training women on how to install new wells. Sixty-five percent of the funding for these projects comes from AMREF, while the other 35 percent comes from the community, not necessarily in capital but through labor and upkeep in kind, Meadowcroft says. “Kitui is a very male-dominated culture,” she says, and when AMREF initially started its training program, there was significant backlash. “On any given day the poverty level is such that you earn about a dollar and a quarter,” she says. “These women are earning $100 a month from doing this.” Ten years after the program began, however, other communities are now reaching out to those women to help build wells elsewhere. 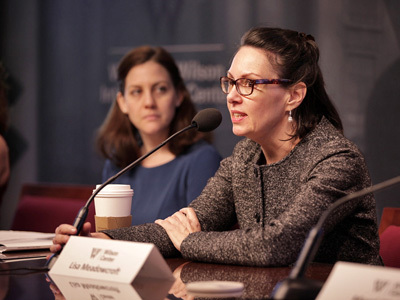 Lisa Meadowcroft spoke at the Wilson Center on March 10. Download her slides to follow along.